Michael Rosen and Chris Riddell have teamed up to publish a collection of wonderful poems for young children, called A Great Big Cuddle. 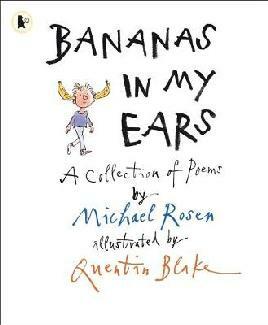 It’s a big, beautiful book full of Michael Rosen’s poems and illustrated by Chris Riddell. It’s out now from Walker Books. Check out these great videos of Michael Rosen performing some of his poems from A Great Big Cuddle. I love his poems but seeing him perform them is terrific. He’s got a fascinating face that is incredibly animated when he performs. There are all sorts of poetry books you can find in the library. There are nice, sweet poems about friends, poems about animals, or poems about monsters. Some of them rhyme and some of them twist and turn all over the page. 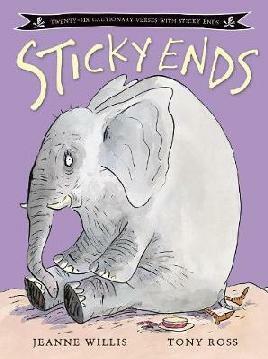 Sticky Ends is a new collection of twenty-six very funny cautionary verses where the characters come to a sticky end. Some of them are stupendously silly, some are horribly gross, but they’re all funny. In Sticky Ends you’ll meet Bubblegum Pete who ate all the bubblegum he could eat, but then comes to a sticky end when he blows the biggest bubble and gets blown away. There’s a very naughty Father Christmas who gets blackmailed by a naughty boy, Lardy Marge who eats too much butter, and Filthy Frankie who gets cocooned in snot. If you ever need a really funny poem to read aloud at school or to make your parents squirm, Sticky Ends has a great selection to choose from. If you’re looking for it in the library, just look for the picture of an elephant sitting on a person on the front cover.